How better to start off a project than to make sure it comes out of the ground correctly. Brooks Engineering Associates, P.A. is the right professional civil engineering team to carefully design the site and civil work to have the best result. Our team has the diverse background and is “right sized” so that engineering work can be produced in the fastest time possible. Cost effective and efficient grading plans reduce project costs. Challenging terrain is properly engineered with appropriate methods. Steep sites with correct slope retention systems routinely solved. 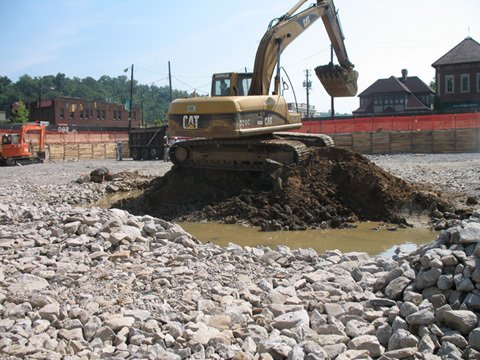 Properly designed erosion control systems protect the site from regulatory trouble. Staff are in close contact with local regulators to ensure design approval. The permitting process is greatly improved with the right design the first time. Best management practices are included in our stormwater management design. Design of large and small systems for commercial or municipal use. Extensive expertise in lift station and residential low pressure systems. Process design and complete engineering services from single residences to large community projects. Specific services are available for industrial applications. On-site wastewater systems permitted through the onsite water protection section or irrigation systems permitted through Division of Water Quality. Process design and complete engineering services for residential, commercial and industrial needs. On-site systems available to serve large apartment complexes that require fire protection. We are well versed with the latest regulatory permit requirements. Including well and wellhead construction and water management plans.